Ask people who’ve walked, biked or driven on Logan Blvd. from Rockwell St. to Lathrop Homes on Diversey Ave. and they’ll tell you it’s a dangerous, high-stress experience. The stakes for fixing Logan to Lathrop couldn’t be higher. A continuous 27-mile Chicago River Trail is coming to fruition, including a new trail at Lathrop and projects like the 312 RiverRun Trail and Manor Greenway. The growing network of riverfront trails is only useful if it’s safely and easily accessible to neighborhood residents. This stretch is a high-crash area that limits access to the retail corridor surrounding Elston Avenue. It includes the notorious Logan and Western Ave. intersection under the Kennedy Expressway, where people are asked to cross several lanes of traffic with inadequate lighting and poorly marked crosswalks. To address these dangerous conditions, Active Trans, in partnership with Logan Square Neighborhood Association and Port Urbansim, sought feedback from residents and stakeholders over the past ten months to identify and build support for improvements that make it easier to walk and bike. Today, we’re pleased to release these recommendations in our new report, Reimagining Logan Boulevard to Lathrop Homes. The report features a variety of recommendations to improve conditions for people walking and biking, including removing a travel lane on Logan for a short segment from Western to the service drive to create more space for people walking and biking. 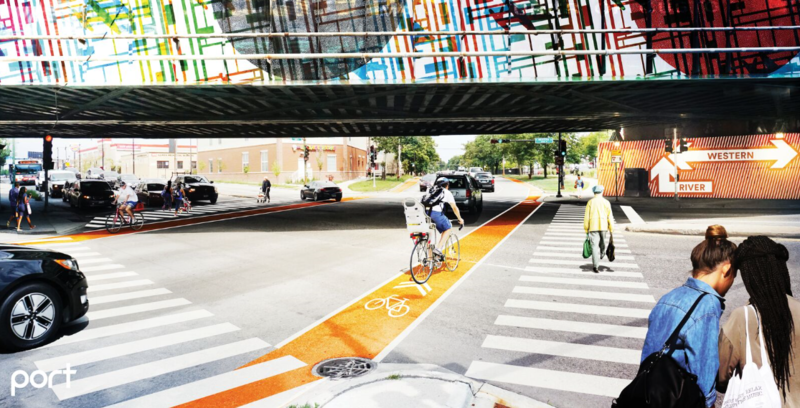 It also recommends installing protected bike lanes on Logan and the Diversey Ave. bridge, re-painting crosswalks and adding a crosswalk on Logan at Western Ave. (pictured). All recommendations were informed by neighborhood residents and an advisory committee comprised of 20 organizations. Please join us at 3:30 p.m. on October 30 for a rally in support of improving safety on Logan Blvd. It will be held on the north side of Logan on the service drive directly west of the skate park. Both 1st Ward Alderman Proco “Joe” Moreno and 32nd Ward Scott Waguespack are planning to attend. Most of the part of Logan that we focused in this project — from Rockwell St. to Diversey Ave. — sees an average daily traffic count of 8,900 vehicles, making it an excellent candidate for right-sizing for a short segment from Western to the service drive. Cities have seen significant safety benefits from right-sizing four lane roads like Logan that carry as many as 18,000 vehicles. Active Trans will continue to work with neighborhood residents and stakeholders to advance these improvements. We’d like to thank more than 1,600 residents who provided input and the project advisory committee for its significant contributions. But our work is not finished: We need you to help us fight for these improvements — some of which will require long-term support. Take action now and support safety improvements on Logan by signing our petition to Aldermen Moreno and Waguespack. Please join the movement for a safer Logan Boulevard and our campaign for a continuous Chicago River Trail.